In large bowl, break up cookie dough. Stir or knead in 1/4 cup flour until well blended. Reshape into log. If too soft to cut into slices, refrigerate up to 30 minutes. Heat oven to 350°F. In medium bowl, mix coconut, sugar, 1 tablespoon flour, the almond extract and egg white until well blended. Cut cookie dough into 32 slices. On ungreased cookie sheets, place slices 2 inches apart. On each slice, spoon 1 rounded teaspoon coconut, spreading slightly. Press 1 cherry half, cut side down, on each. Bake 12 to 15 minutes or until edges are light golden brown. Cool 1 minute; remove from cookie sheets to cooling racks. If you don't get the cookies off the cookie sheet in time and they start to stick, pop the cookie sheet back in the hot oven for a minute or two. 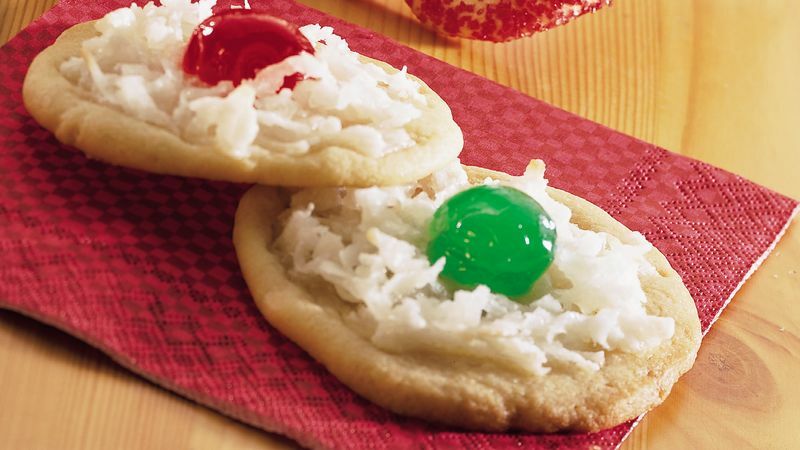 The heat should soften the cookies slightly, making removal easier.